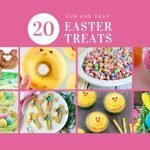 Looking for fun ideas to celebrate Earth Day? Whether you need treats for school, snacks for an event or sweets for a bake sale, these awesome Earth Day Sugar Cookies will do the trick. 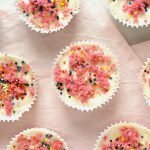 These colorful cookies look so pretty, no one will ever know how quick and easy they are to make! 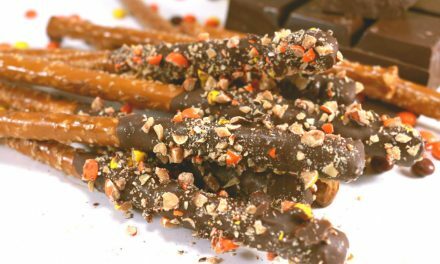 All you need are 3 simple ingredients for this recipe. 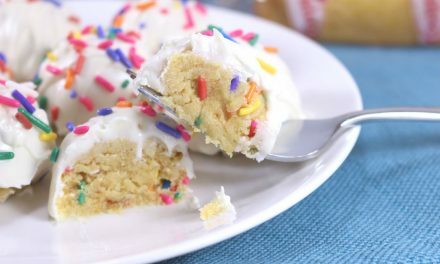 Refrigerated sugar cookie dough. 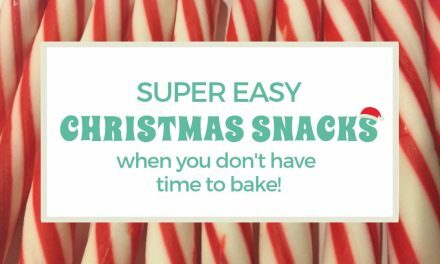 If you have a favorite homemade sugar cookie recipe, feel free to substitute. Green and blue food coloring. I use AmeriColor Food Coloring. It’s a concentrated gel, so you get a vibrant color with just a couple drops. My green and blue colors turned out gorgeous. Flour. When you work the dough with your hands, it may get a little sticky. 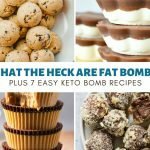 Just add a bit of flour and it should do the trick. First, open your package of sugar cookie dough. Divide it evenly into 2 bowls. The next step is to color the dough. Add 2-3 drops of green food coloring to one bowl and 2-3 drops of blue coloring in the other bowl. Keep in mind that you can always add more color, but you can’t take it away. Mix the dough in each bowl with a spoon or your hands. I personally like to get in there with my hands and feel the dough squish around. You can put on food service gloves or even cover your hands with Ziploc baggies if you’re worried about getting food coloring on them. Keep working the dough until all the coloring is incorporated and you have a nice, consistent color. You can add more food coloring, a drop or 2 at a time, until you have a color that you like. I achieved the gorgeous coloring in my cookies with only a few drops of AmeriColor Soft Gel Paste. 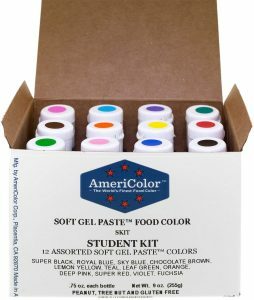 I’ve used other types of food coloring in the past, but I like AmeriColor the best. The colors are so vibrant and the consistency of the gel makes it really easy to add just a drop at a time. The colors blend quickly and easily. Tons of colors and sets are available on Amazon. Below is the starter set that contains the Sky Blue and Leaf Green colors I used in this recipe. As you work with the dough, the heat from your hands may cause it to get a little sticky. If that happens, just sprinkle in a dash of flour and that should help. Next, grab your baking sheet. You’ll be baking the cookies according to the instructions on the package of cookie dough. Be sure to check if the directions say to grease your baking sheet. If so, now would be a good time to do that. Now is also a good time to preheat your oven. Now comes comes the fun part – creating our little Earth patterns. Start by pulling out little chunks of dough for both bowls. Use the little pieces to start forming a ball (about an inch across) that has green (land) and blue (water) patterns. Place the cookie dough balls on the tray and flatten slightly as shown in the picture below. Now pop the cookies into the oven and bake according to the instructions on the package. The directions usually give a time range and I always set my timer for the low end. To make sure the green and blue colors are the star of the show, be careful not to over bake them. Although, brown is a natural earth tone, so if your cookies get a bit toasty on the edges, it’ll be okay! 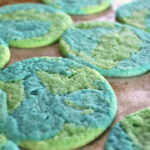 Be sure to pin this Earth Day Sugar Cookie recipe to your favorite cookie board on Pinterest. 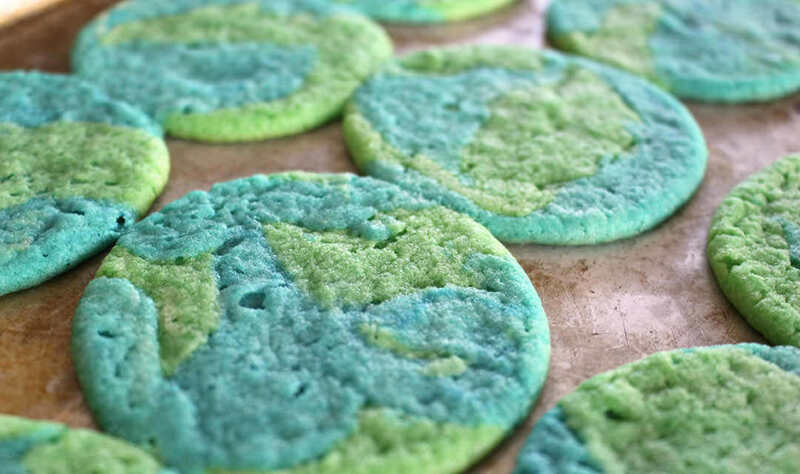 Celebrate Earth Day with this fun and colorful cookie recipe. Ready-made cookie dough makes preparation and clean-up a breeze. Divide the cookie dough evenly into 2 bowls. Start coloring your dough by adding about 3 drops of green food coloring to one bowl and 3 drops of blue to other. Remember, you can always add more color, but you can’t take it away! Continue add a drop at a time until you achieve the color you like. 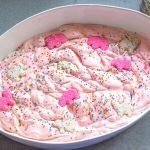 Mix the dough with a spoon or your hands until all food coloring is combined and your dough is an even and consistent color. Sprinkle in a bit of flour if your dough starts to get a sticky. Pull out pieces of dough from each color and start shaping into a ball, patching if necessary to create an Earth effect. Place the cookie dough onto baking sheets and bake according to the directions on the sugar cookie packaging. 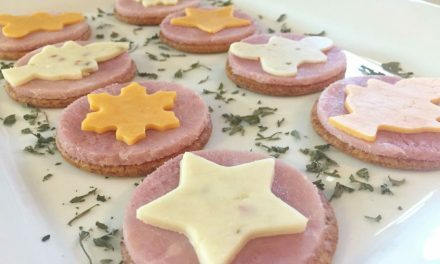 Change up the colors of these cookies to fit any occasion. 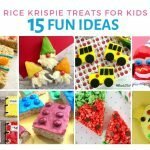 Imagine the possibilities for your child’s school colors, to celebrate holidays or even get crazy with lots of colors with tie-dye cookies.